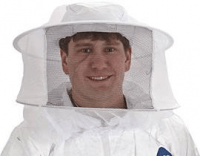 The beekeeping suit is 100% cotton and designed for many years of use. There are (2) waist pockets, (2) chest pockets with Velcro closers. 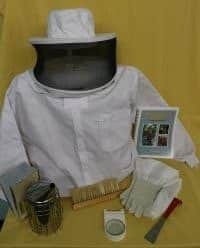 The beekeeping suit leg bottoms have zippers to allow easy wear. Front zipper goes from the crotch to the collar. Double zipper veil is a metal zipper for easy use. Veil is collapsible with good ventilation. Cuff has Velcro to assist in narrowing the sleeve to your wrist. Helmet is extra and comes in plastic or ventilated.